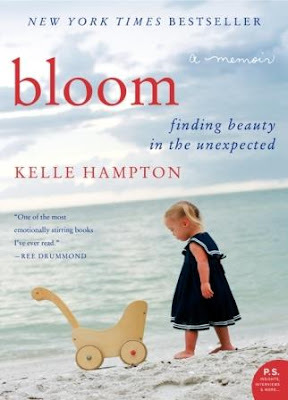 I'm sitting here staring at my laptop trying to figure out where to begin my review for the book bloom, by Kelle Hampton. I can start by saying how I kept calling her "KeLL" and am not sure if she's Kelly or Kell or what - although I feel like I should know this, like it was mentioned in her story, but right now that's not clear. What is clear is how amazing her motherhood experience has been. Is. "I know I do not know you, but today I finished reading your book. I received it to review and I am sitting here at a loss for words. It was beautifully written and your words, your sentiment, experience, friends and family? All amazing and beautiful. I kind of want to join your "net" - which is so totally weird, but I had to say it anyway. Thank you for sharing your life with us, your readers. All the best to you and yours!" That is kind of confusing when you don't know the whole story, but you can grasp where it all meshes in my mind, and how it seems to be. It's a beautiful, sentimental, emotional, inspirational and even spiritual kind of story. The story of how Kelle met her daughter Nella and in an instant knew she had Down Syndrome. The story of how things unraveled and then re-raveled (so not a word, but that's where I'm at right now) from there. Emotion. Exhaustion. Anxiety. Fear. Hysterics. Tears. Fright. Unknown. Support. Love. friendships. Family. Father. Mother. Sister. Husband. Daughters. Incredible and amazing circle that surrounded Kelle and her family as she moved forward with absolutely loving her baby girl. I'll admit I had heard of the book for a while before the opportunity to review it came along. I was holding out for the paperback because I do that sometimes. This was in my pre-Kindle days, but still, the kind of book I needed to hold in my hands. I didn't know enough about it, I just knew I wanted to read it. I didn't know that Kelle's daughter Nella was born with Down Syndrome. I didn't care. I just knew from the cover images and color scheme and the title and the thoughts that it was written by a mother about her motherhood experience that I needed to read it. I picked it up. Started reading. Mind you, this isn't a light-hearted read. It's not chick lit or a beach read or a mystery or a fluff piece. We start off with a mother whose dreams of a future are wrenched away from her because of the unexpected. Yes, that sounds horrible, but it's not - not truly. It's honest. It's a release of fear. Hampton did that after the birth of her daughter and was recognized for it. The responses to her efforts of release and writing were strong on her blog. Some favorable. Some not so much. But you have to give it to her - the woman is real. She's putting it all on the line here and telling us she was terrified when she first saw her daughter. Afraid of what the future might bring. What would happen to her eldest child, when she met and grew up with the sister she wasn't expecting. What battles might the family face in years to come? She thought and shared all of this, all the while sharing the love. How much she loved Nella was likely beyond words. But she used them anyway. She somehow came up with the right set to not just blog about it, but to create this absolutely beautiful book. bloom is not necessarily for everyone. I have to be honest in saying that. But it's a powerful read. A beautiful one. I enjoyed it. But it might make you cry. A lot. I'm weirded out by the fact that I didn't cry. I think I was so moved I just kind of moved along, in awe of a mother's strength, love and power. And the reminder that we're all a little bit perfect in our very own way. It sounds tough... good, but tough. The best ones usually are. I was really captured by the beauty of the cover as well. I didn't realize that there was additional photography inside! If it is anything like the cover then I'm sure it packs a punch. Thanks for such an amazing review for the tour. I'm featuring your review on TLC's Facebook page today. I've seen this book in the library, never picked it up. I will now! !